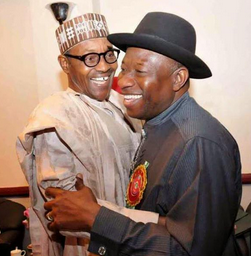 Nigeria is less than a month away from its presidential election that is shaping up to be a classic contest between President Goodluck Jonathan of the People’s Democratic Party (PDP) and General Muhammadu Buhari (Rtd.) of the main opposition party, the All Progressives Congress (APC). Elections are also going to be held for governors and legislators at federal and state level in February. The campaign has reached fever-pitch with the candidates and their supporters throwing their best shots at their opponents in the process of attempting to convince the electorate that they are the best candidate for the office they are running for. One key factor that has characterised this campaign is the use of negative tactics by the two major parties that can at best be described as attempts at destroying the image of the opponent. However, this is only leading to deep division along ethnic and religious lines which are well-known fault lines in Nigeria. The suggestion that because of a certain candidate’s religion, he should not be voted for or that a candidate should get our votes because he is from a certain part of the country only help to entrench division and hatred that can lead to conflict and violence. A bad example of an attempt at destroying an opponent’s image was the front page advert in the Punch newspaper on Monday, January 19, 2015. In the advert sponsored by Governor Ayo Fayose of Ekiti state, a PDP member and supporter of President Goodluck Jonathan, it was suggested that General Muhammadu Buhari might die in office if elected as President, like former Heads of State, General Muritala Mohammed, General Sani Abacha, and President Umar Musa Yar’adua. This has caused outrage in the public with many people including some PDP supporters condemning the advert. However, until we the voters begin to teach politicians that we seek proper governance by asking them to tell us in clear unambiguous detail how they intend to address issues like insecurity, unemployment, poor infrastructure and economic downtown that affect us, we will continue to be ruled by such crude people who don’t care about our needs. What can we expect from Governor Fayose and his ilk when he got elected into office in Ekiti state on the back of a campaign based on “stomach infrastructure”? The premise that Nigerians will vote for you as long as you can give them “something to eat” immediately rather than empower them to feed themselves and others for life was shockingly successful in Ekiti state last year. Should we blame him if he takes encouragement from his success in Ekiti state and then tries to support his preferred presidential candidate with odious effrontery at the national level? I submit that we should not blame Governor Fayose and his ilk at all, rather, we as a people should blame ourselves for not teaching politicians in the past that such political rascality as he exhibited during his first tenure as governor would not be tolerated by us and punished at the polls with our votes against them. We must as a matter of urgency begin to ask all the major candidates at all levels the pertinent questions and not allow ourselves be victims of our collective poor decision-making as voters once again. The chance to right some of the wrongs of the past beckons on us in February 2015, the big question for us is: shall we get it right this time?